The Coast Guard Boating Safety Mobile App is scheduled to be released Saturday May 16, 2015 as the kickoff to this year’s National Safe Boating Week. 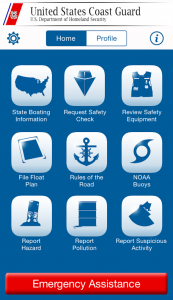 The Boating Safety Mobile App will be available on the Apple and Google Play online stores. The new app was not designed to replace a boater’s marine VHF radio, which the Coast Guard strongly recommends all boaters have aboard their vessels. The app was designed to provide additional boating safety resources for mobile device users. The app also features an Emergency Assistance button which, with location services enabled, will call the closest Coast Guard command center. National Safe Boating Week, May 16 - May 22 is an annual event that encourages all boaters to practice safe boating. The Coast Guard Mobile App is self contained, so personal information is stored on the phone and is not sent to the Coast Guard unless the user chooses to send it. The app does not track a user’s location unless the app is being used, the Coast Guard does not track a user’s location. The app was developed over a two-year period along with BastayaPR, a non-profit organization from Puerto Rico.